Resistors are one of the main building blocks of a circuit. They come in a large range of values to fit any type of circuit design. To discern the specific values for a circuit, the resistors are marked with color coded bands that have a different number per color, as well as the tolerance of the resistor. 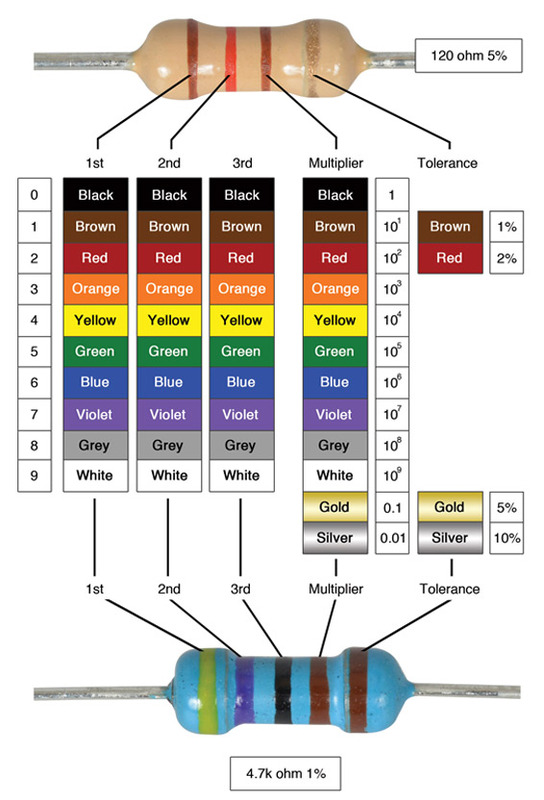 Determine the values of all your resistors with this resistor color chart. The gold and silver band is only for tolerance. Some resistors have the color bands grouped. Hold the resistor with the closely grouped bands to your left and read the resistor from the left to the right. For 5% and 10% resistors hold the resistor with the silver or gold band to the right and read the resistor from the left to the right. The first band will never be silver or gold. If no multiplier stripe is present, the tolerance is 20% (very rare nowadays). Decoding - 3d (for 20, 10, 5, 2%) or 4th (for 1%) color stripe can also be interpreted as the number of zeros to add after the 2 or 3 significant digits to get the resistor value in ohms, instead of calling it a multiplier. Gold and silver are of course an exception to that statement. Sometimes smaller sized wirewound resistors have color stripes like regular resistors, and they may use the multiplier silver or gold color stripe as the decimal point for values less than 10 ohms (European standard).